Ireland is a small country with a big reputation. It is situated in the Atlantic Ocean separated from Great Britain by Irish Sea is the third largest island in Europe and twentieth largest on planet Earth. Enjoy a visit to this fascinating country and experience the best of fashion, modern theatre, art, comedy, music along with abundance of natural beauty and a fascinating friendly people whose lyrical nature is expressed in warmth of their welcome. Ireland represents an astonishing cultural surplus. Everywhere you go history of country presents itself from breathtaking monuments of prehistoric Ireland to fabulous ruins of country’s rich monastic past. Throughout your travel you will be overwhelmed by choices on offer which makes it one of the most admiring holiday spots in Europe. This quintessential holiday destination has all the prerequisites of a perfect family friendly vacation. 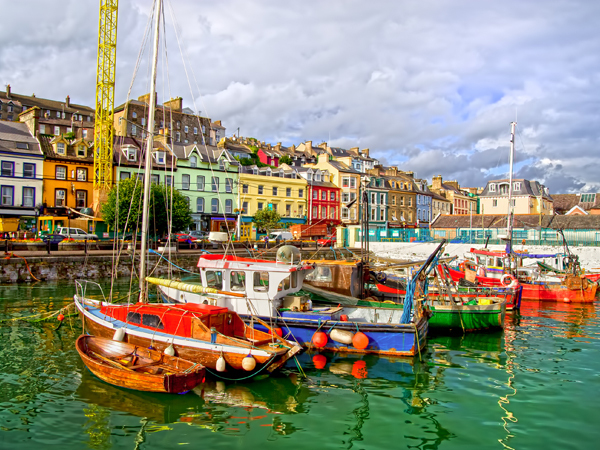 So pack your bags and book flights to Ireland a beloved worldwide destination where legend and reality mingle. Here we take a bird eye view on some amazing destinations for tourists in this enchanting land of natural beauty and modern amenities. With cinematic sea views, white powdery sandy beaches and mountains covered with mist, on a Ring of Kerry it seems that every corner of it is worth of photographing. The destination has earned its reputation as one of the most beautiful regions in Ireland. It is a 179 km loop starting and ending at Killarney is worth visiting. It passes through various vibrant lively villages, bustling pubs, pretty cafes, elegant restaurants which makes it even more scenic and worth visit. Don’t forget to explore Killarney National Park, sitting pretty beneath the rugged summits of Kerry’s highest mountain. Dublin the hot and happening capital of Ireland is bursting with personality and youthful buzz. It is an entertaining capital where visitors are spoilt for choices where to go and what to miss. It offers something for its every visitor. Entertaining cultural pursuits, fine museums, magnificent art galleries, lively pubs, beautiful castles, great cathedrals, beautiful parks, fine shopping and dining, you name it and you have it in Dublin. On a visit to this beautiful city, purchase a pass and gain free access to top 30 Dublin attractions and enjoy huge discounts on restaurants, shops, theatre, transportation etc. Don’t miss a visit to Phoenix Park, Guinness Store House and Trinity College Dublin and enjoy a fascinating holiday experience. If you are a history buff then Ireland is undoubtedly a perfect destination for you where you discover history at every turn. One such great site that you just can’t afford to miss is Bur na Bonniein County Meath which is even older than England’s Stonehenge and Egypt’s Giza Pyramids. This Neolithic site was built around 3,200 B.C. and is highlighted by several large passage tombs: Knowth, Dowth and Newgrange. Though it remains immensely popular throughout the year but it gets extra attention during winter solstice, especially during the month of December when a beam of sunlight pierces through a mysterious opening in Newgrange mound and illuminates its chamber for few minutes. It is truly astonishing for its visitors to see this spectacle. To visit more such spectacular attractions plan your trip with business-class-flight and give a flying start to your journey. Ireland is a very famous holiday destination throughout the year no matter when you visit it. The country has abundance of fantastic festivals and events that are continually attracting visitors from far off places. Belfast festival of Queens is one of country’s largest international art festivals that take place at the end of October or in the beginning of November attracting host of international acts in art, dance, drama, music, literature etc has over the time become one of the largest events of its kind in Ireland. Don’t miss Dublin Horse Show which is one of Ireland’s largest events held in the month of August is not be missed event which attracts thousands of people from all around the world. Be a part of the Guinness Cork Jazz festival which is one of the biggest jazz events in the world attract over 1000 musicians from more than 30 countries continues to get bigger year-on-year.